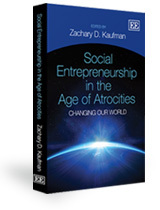 “Social Entrepreneurship in a Post-Genocide State: Building Rwanda’s First Public Library, the Kigali Public Library.” Social Entrepreneurship in the Age of Atrocities: Changing Our World, edited by Zachary D. Kaufman. Northampton, Massachusetts, United States and Cheltenham, Gloucestershire, United Kingdom: Edward Elgar Publishing, Inc., 2012. 58-82.